Fitbit is About to Release Sleep Stages « Adafruit Industries – Makers, hackers, artists, designers and engineers! Fitbit is upping their game with higher quality sleep data. Three of their currently available devices Alta HR, Blaze and Charge 2 will support Sleep Stages within the Fitbit App. Expected release is end of March 2017. 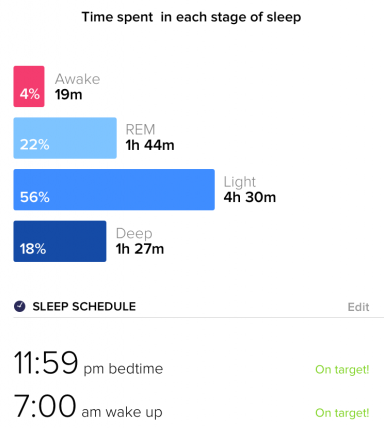 Sleep Stages uses accelerometer data, heart rate variability (the time between beats), and proven algorithms to estimate how long you spend in light, deep, and REM sleep stages (as well as time awake) each night. Each stage is important, but for different reasons. Light Sleep (including sleep stages 1 and 2) occurs throughout the night and is important for memory, learning, and letting your body recover from the day; for most people it is 50-60 percent of your night. Deep Sleep (sleep stage 3) promotes a healthy immune system and muscle growth and repair; for most people it is 10-25 percent of your night (depending on age). Rapid Eye Movement (REM) Sleep is when most dreaming occurs and is important for mental recovery and memory formation; for most people it is 20-25 percent of your night. Most REM sleep comes at the end of the night, and is often the stage that’s cut short when your sleep duration decreases. Awake minutes (between 10-30 times per night) are a normal part of your sleep cycle each night, and is typically when your heart rate is more elevated during sleep. For Sleep Stages specifically, the Fitbit team conducted extensive internal testing by observing and analyzing several hundred nights of heart rate and movement data from volunteer sleepers while simultaneously comparing that to information gleaned from gold-standard lab equipment. 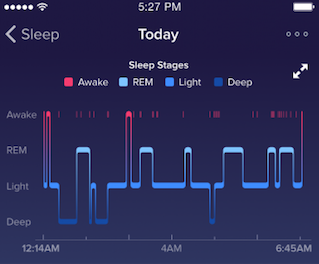 They then used existing research on the connection between heart rate, movement, and sleep stages to develop an automated algorithm that could recognize and track each sleep stage.